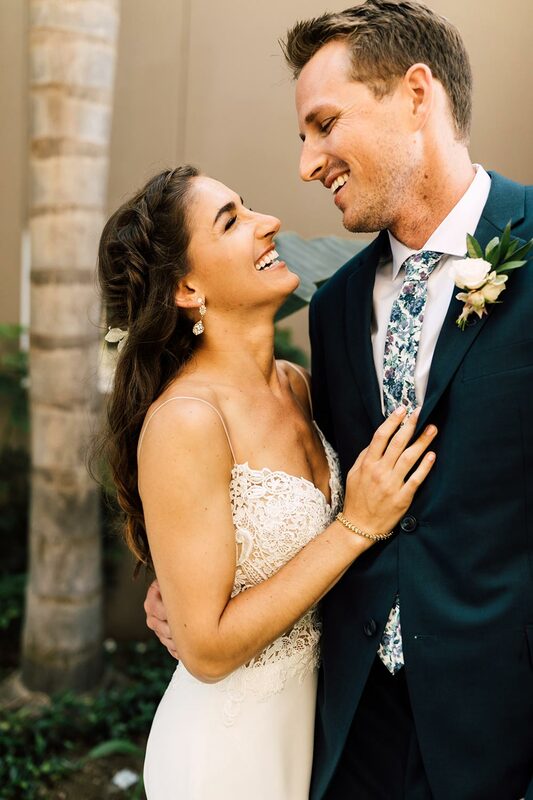 It’s happy here, indeed! 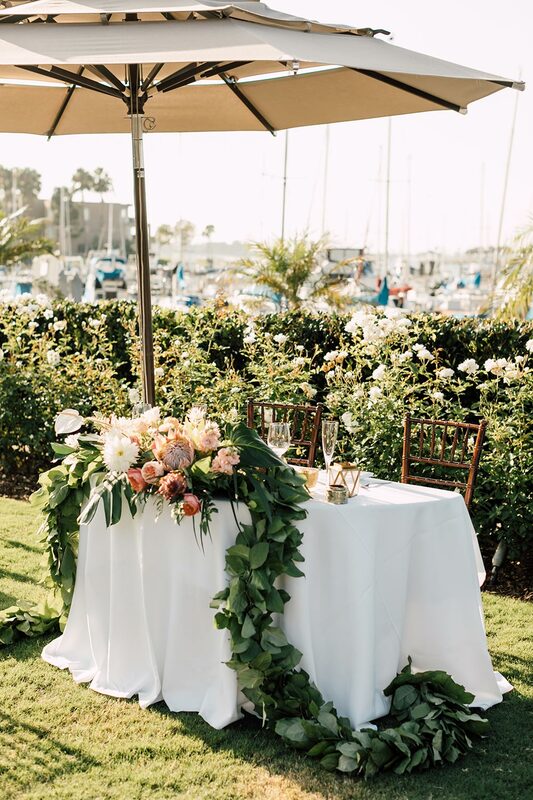 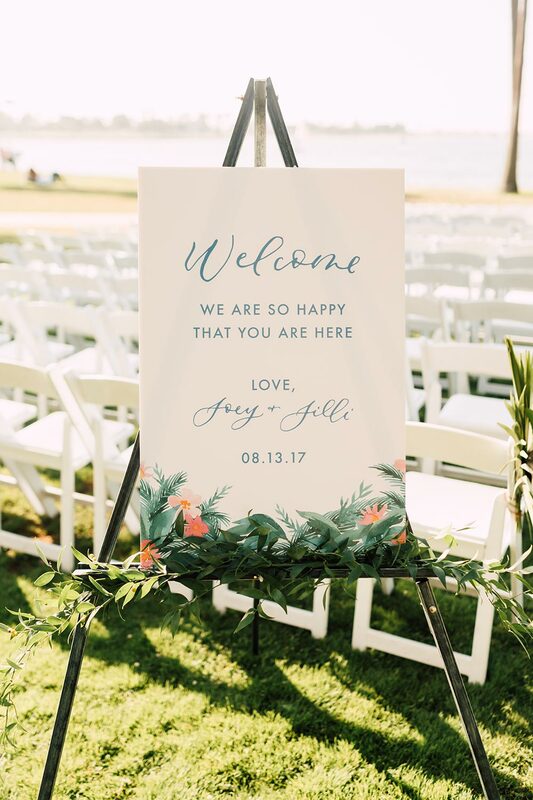 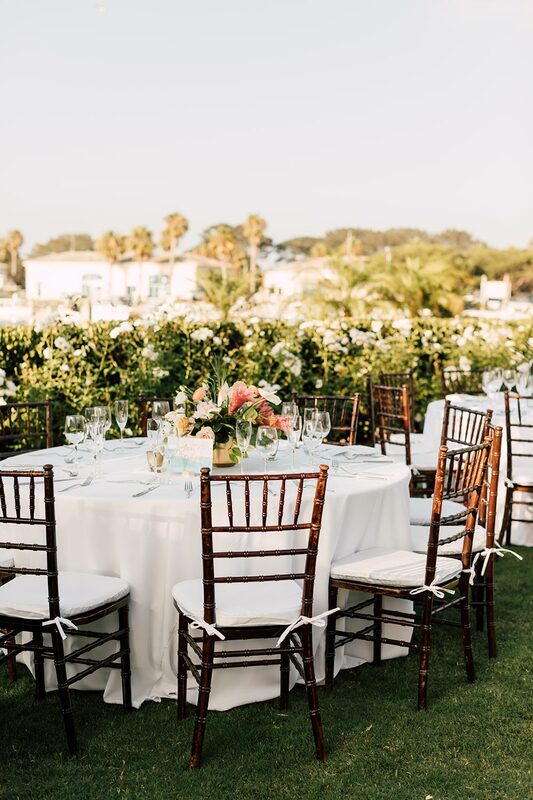 Jilli and Joey’s smiley personalities could only be matched by a beachside celebration complete with palm fronds, whimsy and colorful painterly details, so boy are we hooked. 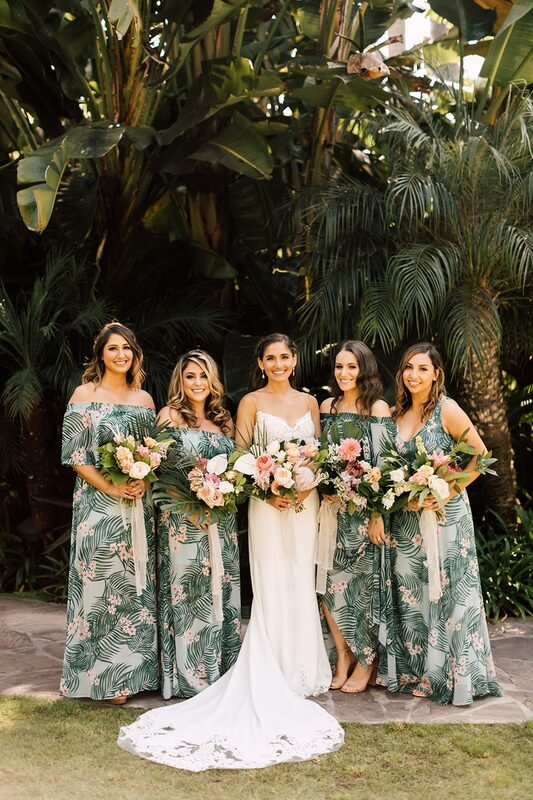 Their watercolor wedding brings vibrance into play from the tropically printed bridesmaid dresses to the rich donut bar that has us inching closer to the screen. 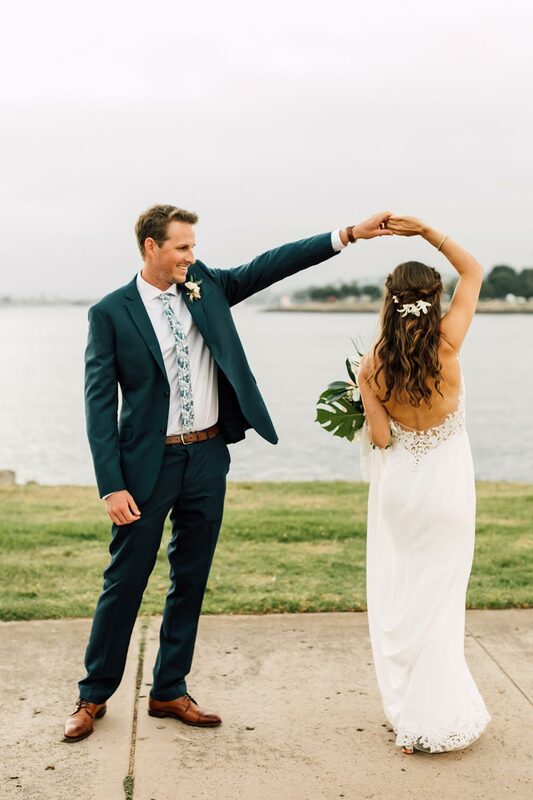 Check it out with us below! 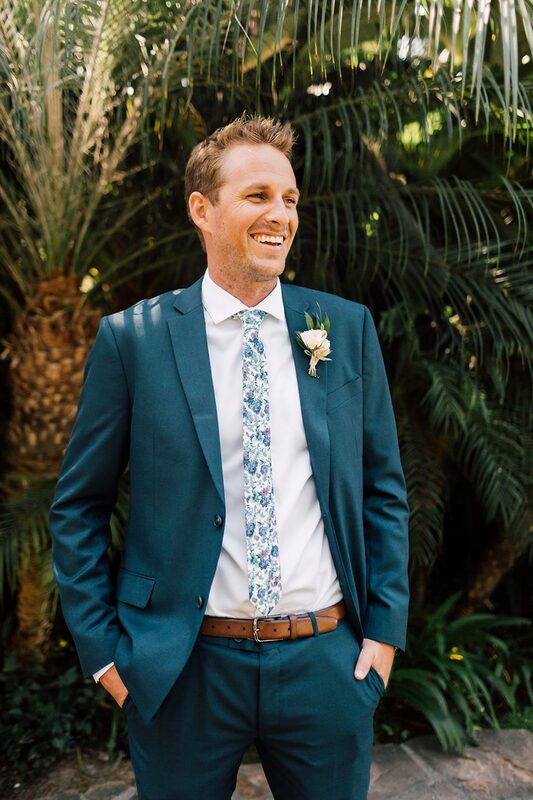 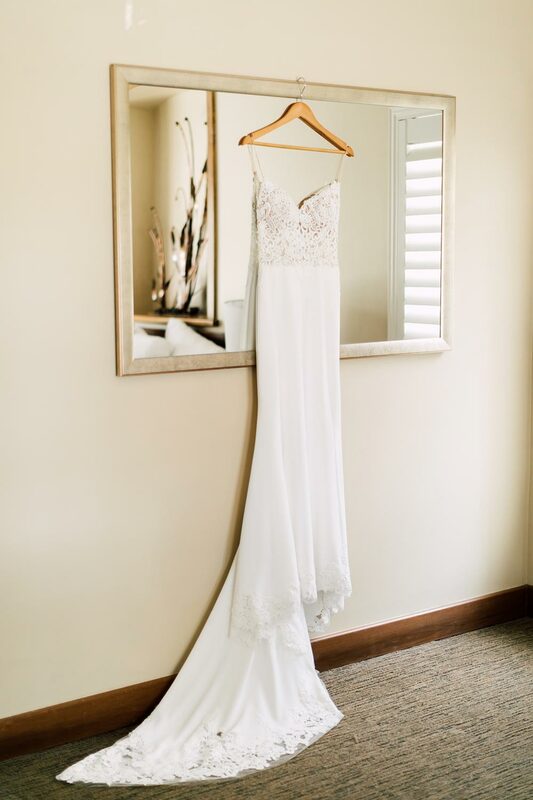 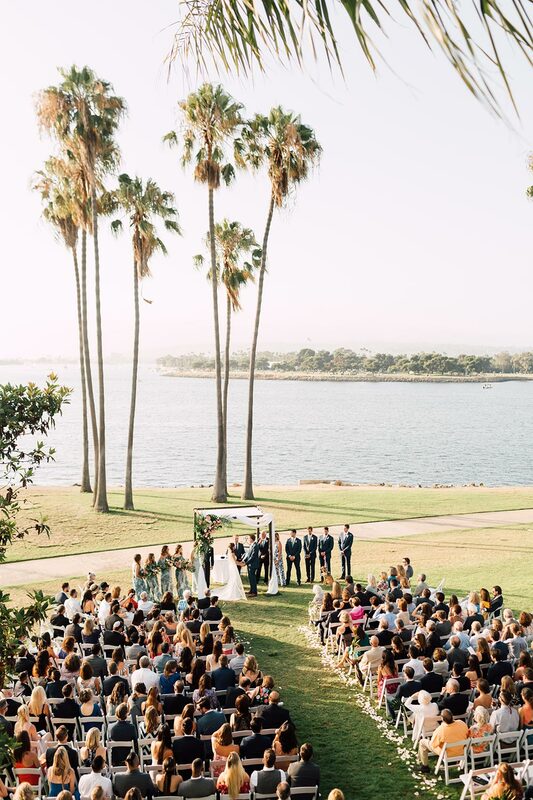 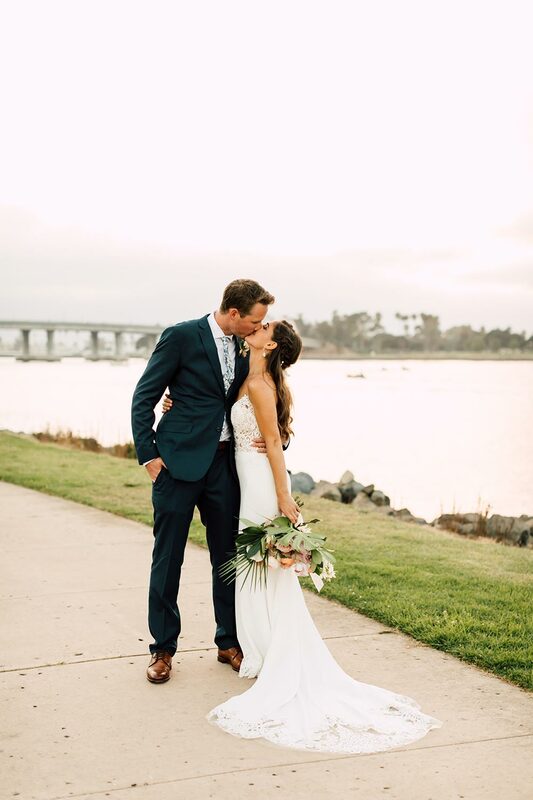 California wedding photographer, Elyse of Plum & Oak Photo, has a spirited personality of her own, so we can see why she’s the perfect match to capture J+J’s wedding day. 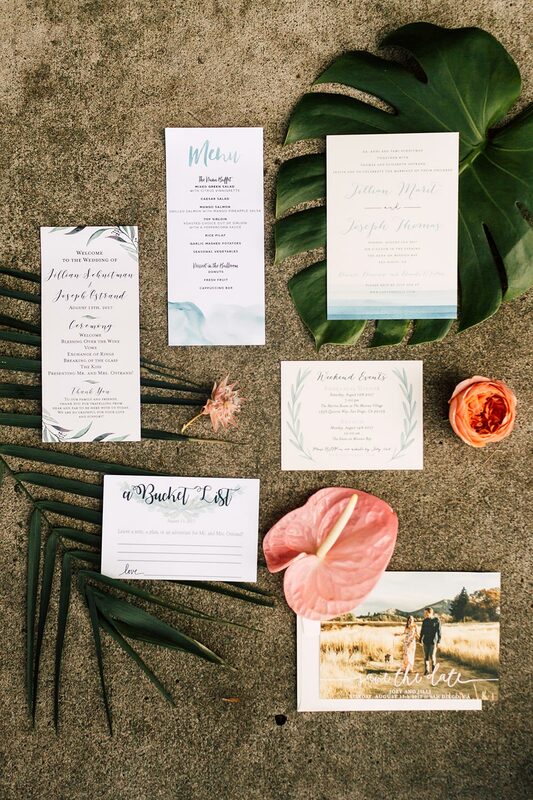 And aren’t these bright details coordinated by Festive Event Planning making you a tad bit weepy? 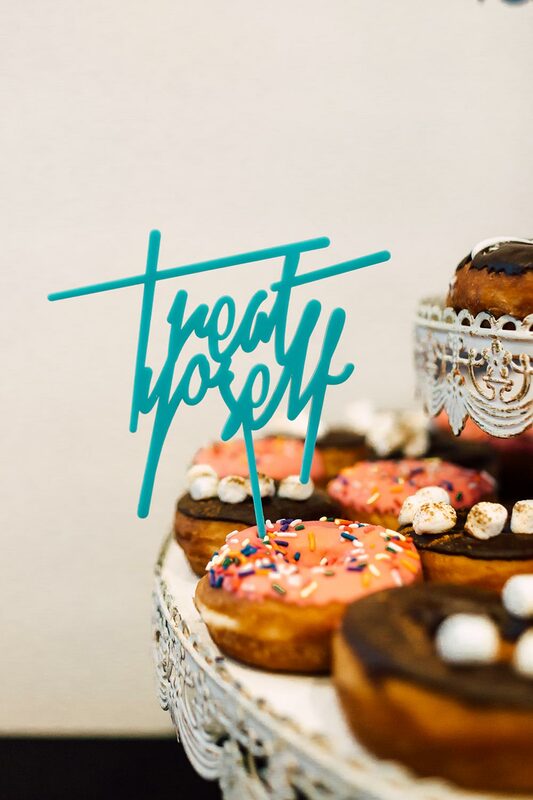 The good kind of course! 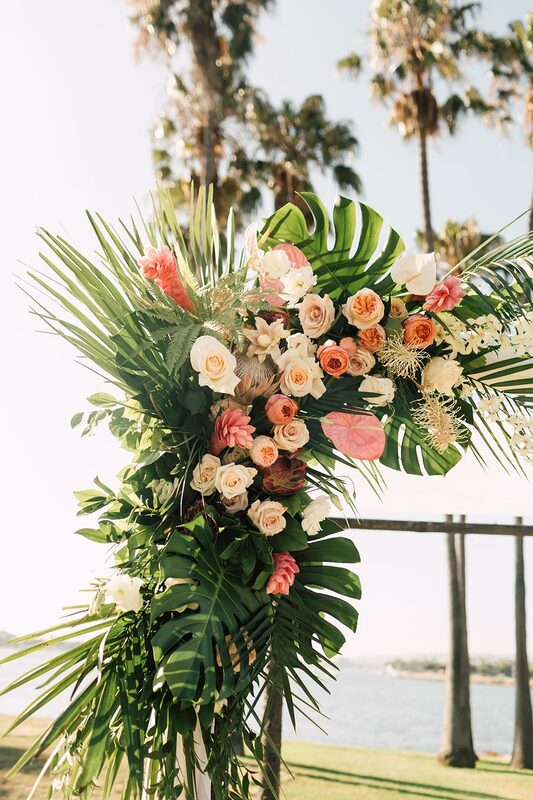 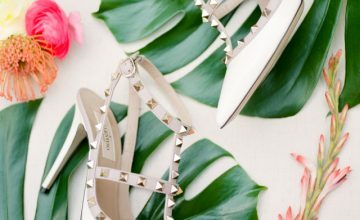 There is paradise in these tropical blooms from The Dainty Lion. 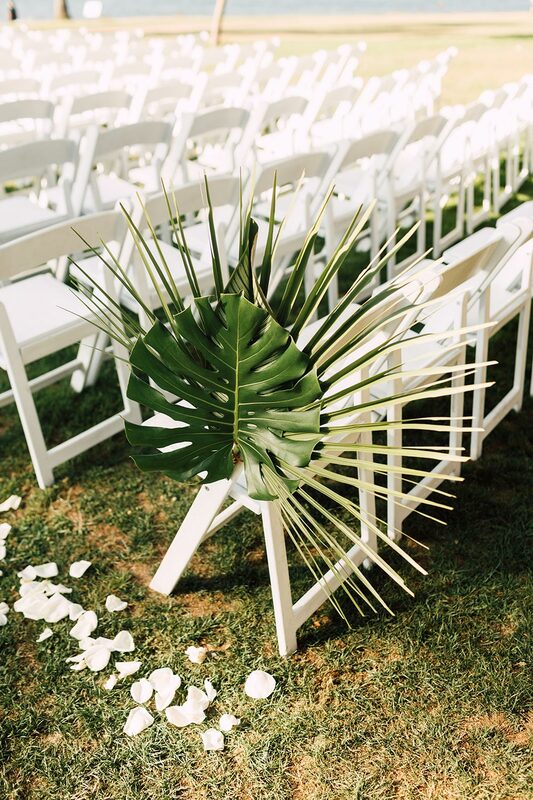 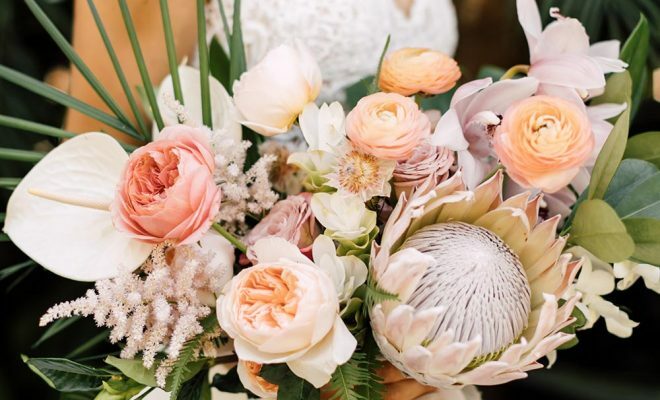 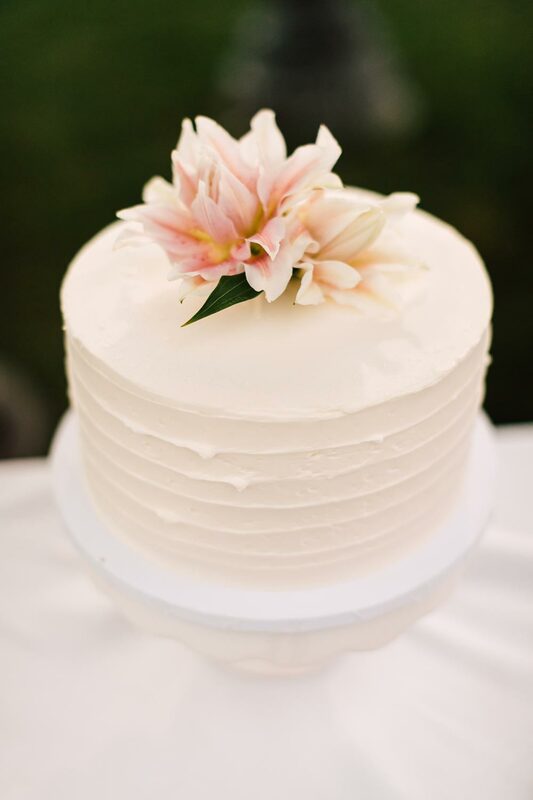 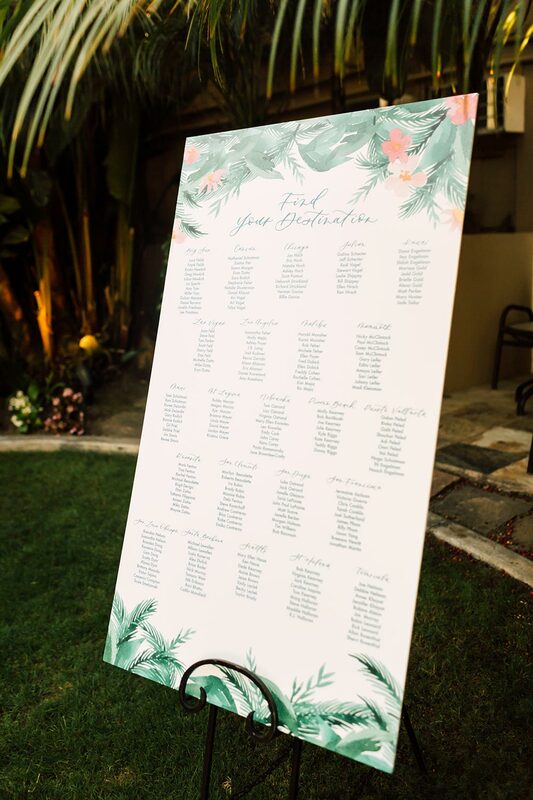 We’re thankful to see her canvas extends beyond the bouquet + ceremony arbor! 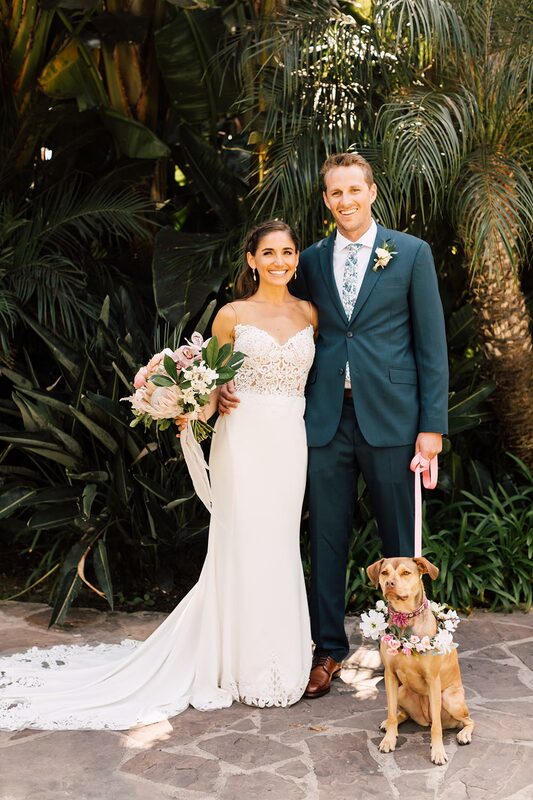 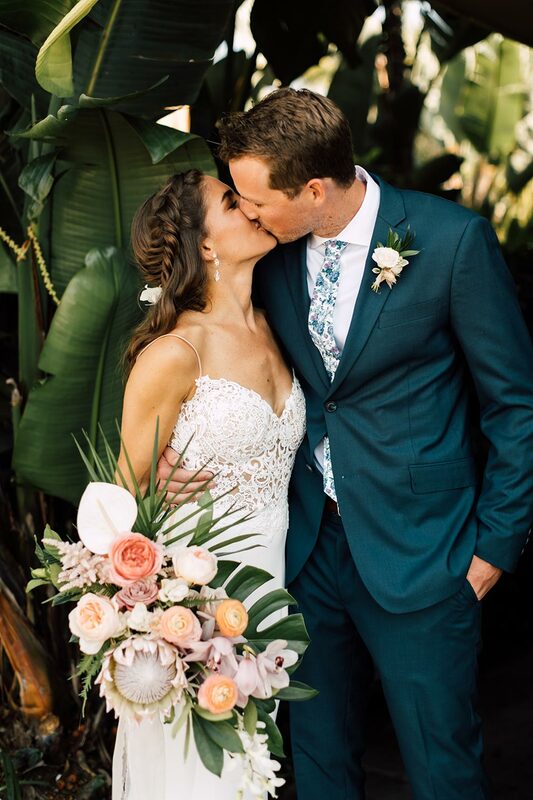 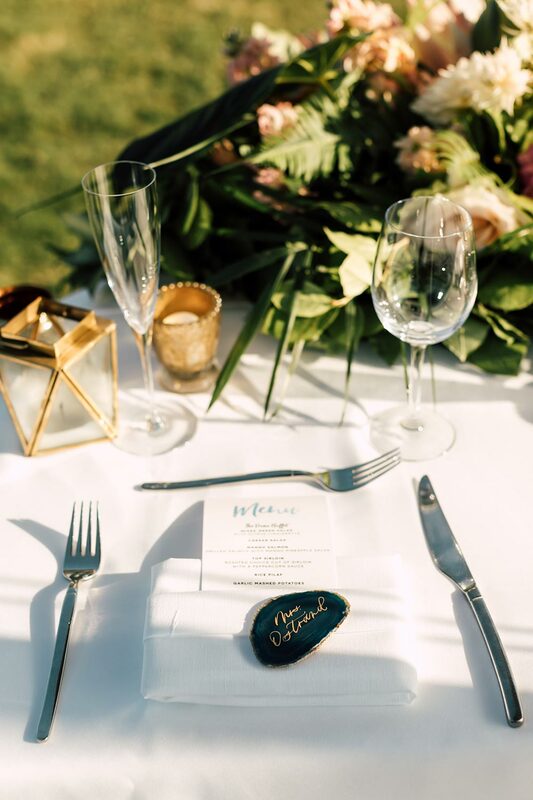 From the coordinator, Megan of Festive Event Planning: Jilli and Joey’s wedding day was a reflection of their relationship – colorful, joyful and full of love! 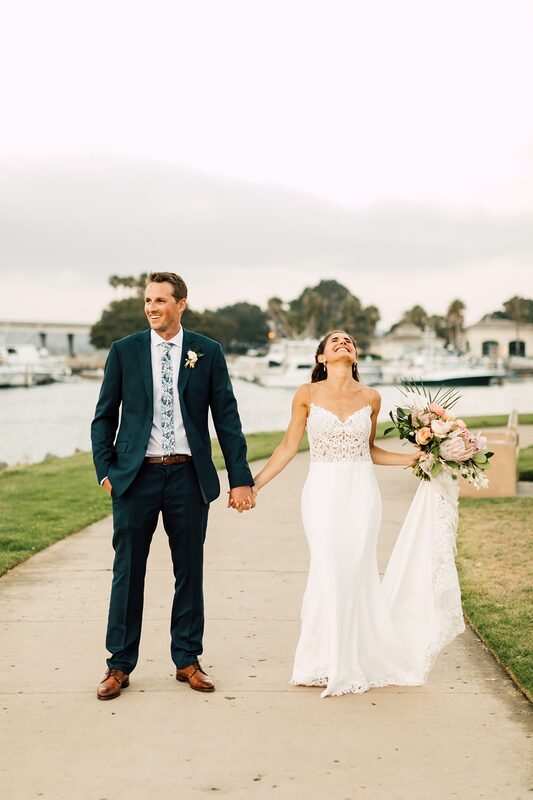 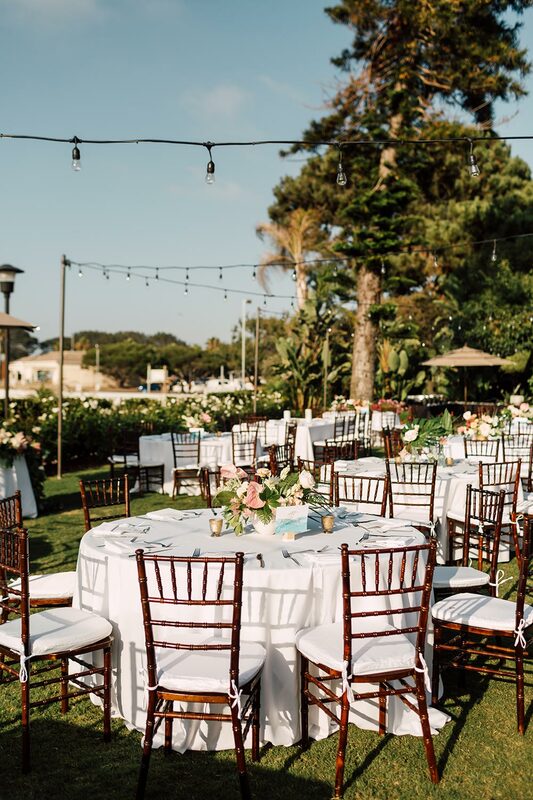 As avid beachgoers (they got engaged on the beach in Big Sur) and San Diego locals they opted to celebrate with more than 200 family and friends at the beachside Dana on Mission Bay in San Diego. 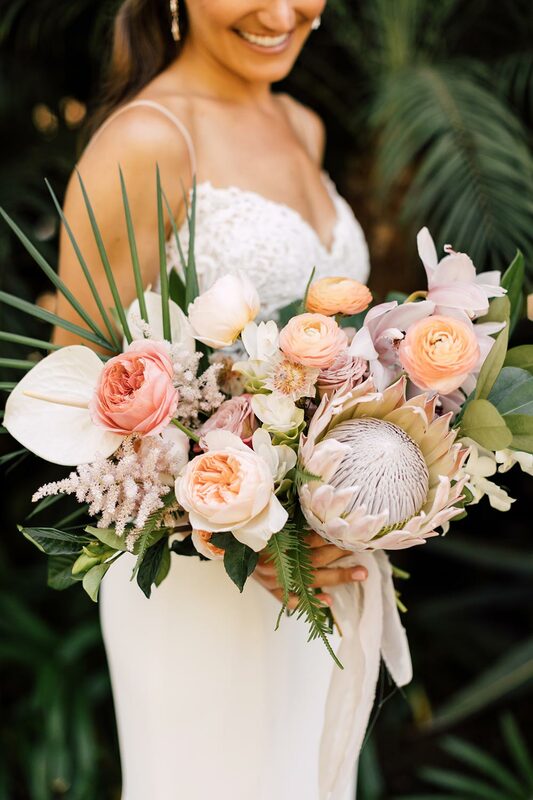 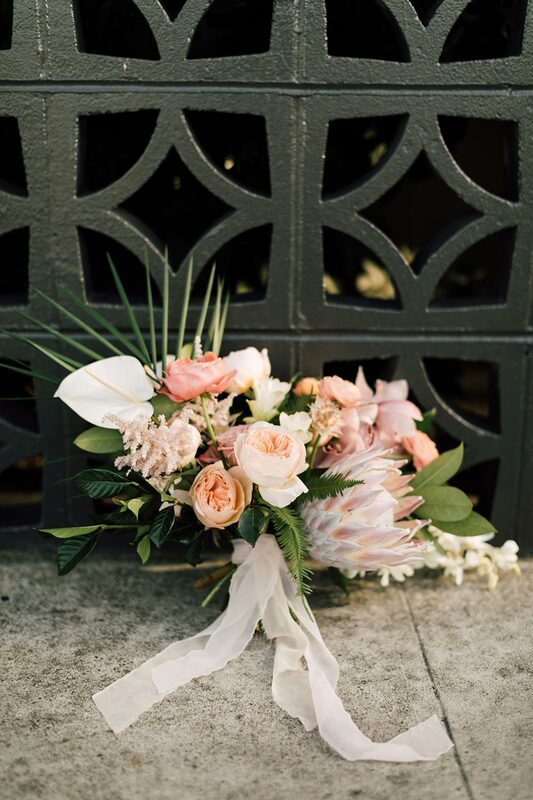 In designing the day, Jilli sought to bring a sense of tropical glam to the design – as reflected in the watercolor and hibiscus-accented paper goods by Twinkle and Toast and the most magical arrangements of monstera, protea, dahlias, roses and more crafted by The Dainty Lion Not to mention Jilli’s STUNNING, form-fitting mermaid gown! 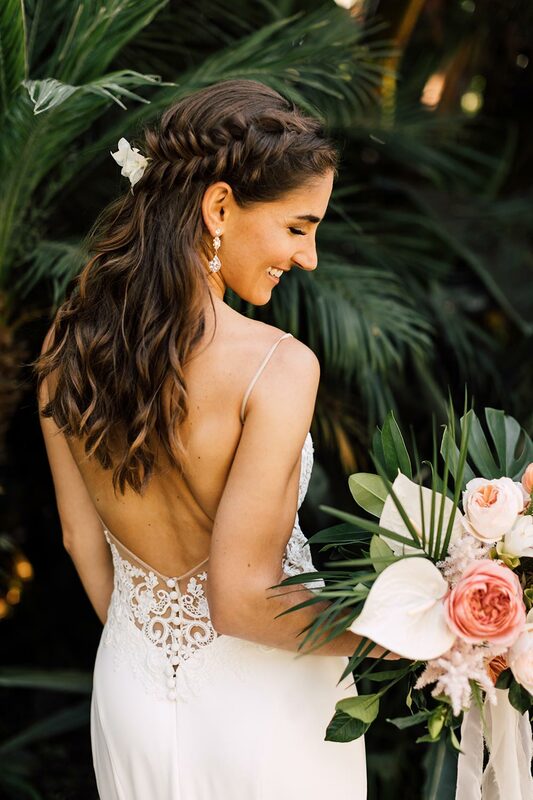 Jilli is stealing the show in her Enzoani gown with a sleek silhouette and intricate lace embroidery across the bodice. 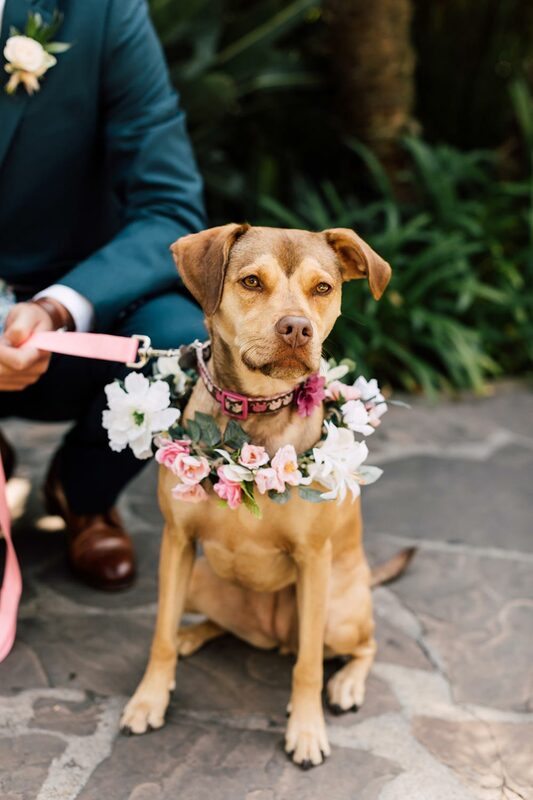 But let’s be real, it’s her show to steal! 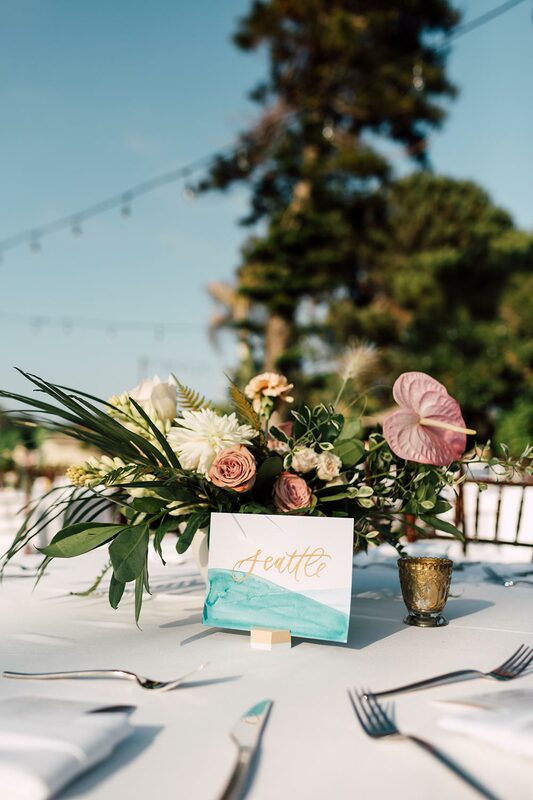 Don’t ya think these painterly table numbers from Twinkle and Toast mimic the ocean waves? 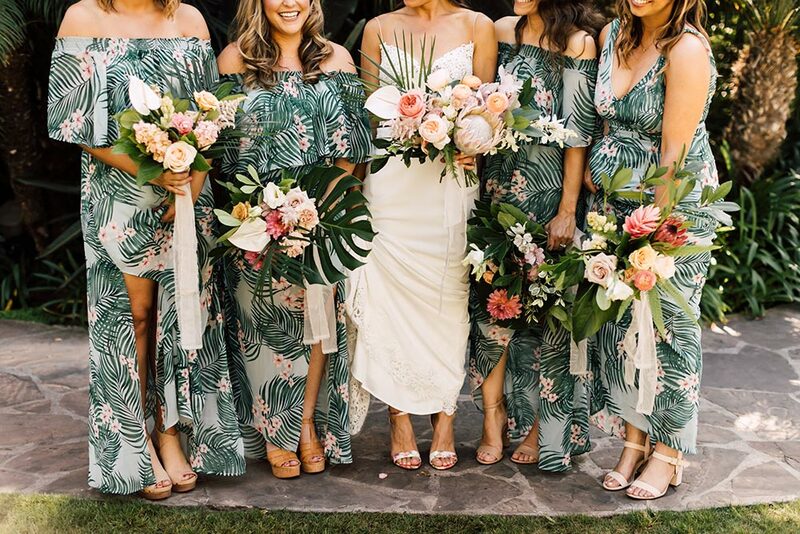 Paradise printed bridesmaid dresses from Show Me Your Mumu. 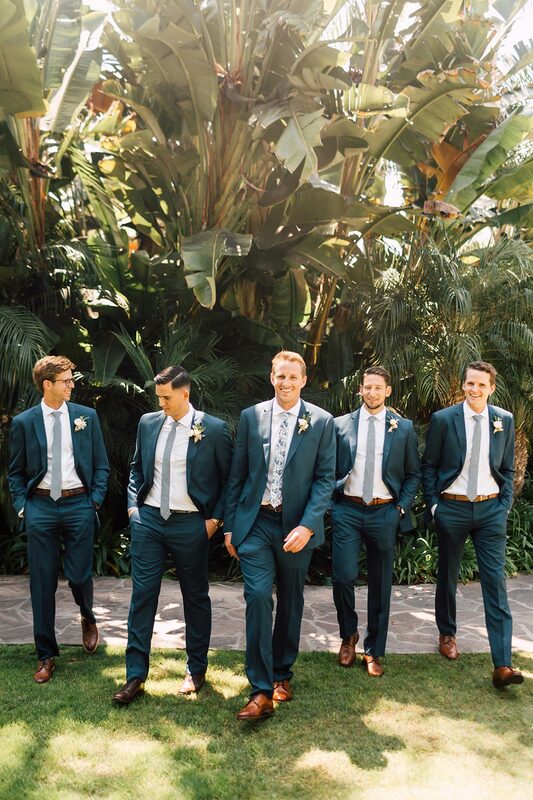 We’ll freely admit that this is the kind of fabulosity that gets us up in the morning. 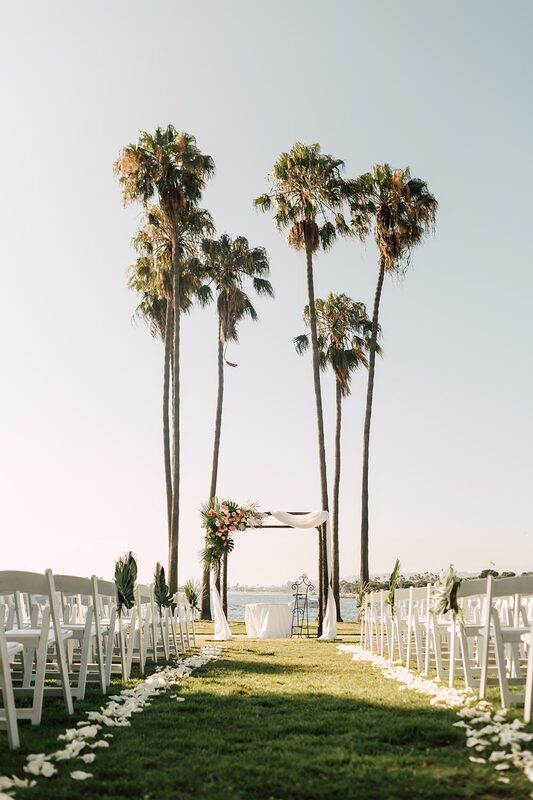 Her golden glow from Beauty By Stacey is the perfect complement to the California sun. 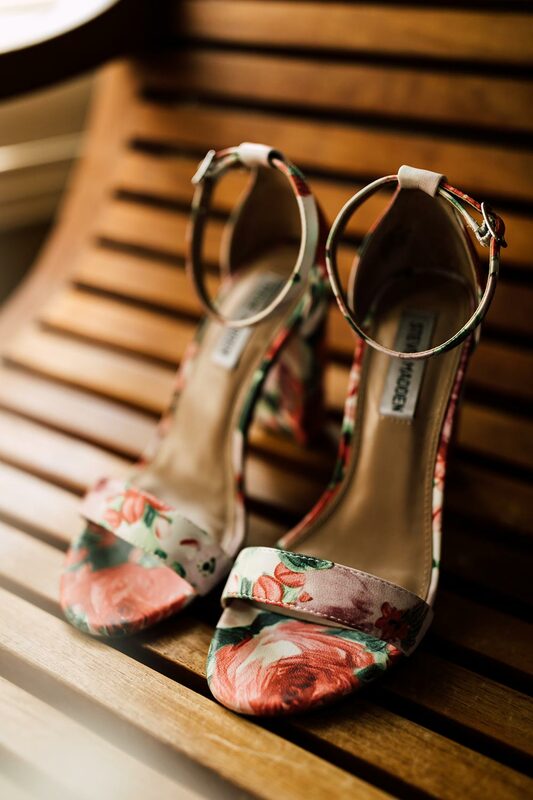 Next Story → Don’t Miss the Maison Signore Trunk Show in New York!